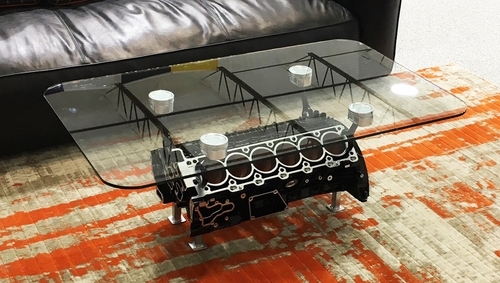 The pictured V12 Mercedes table has a lot of custom work done to it so it can be used as a table. There is a bunch of metal melted into this block around the pistons to properly mount the connecting rods so that the pistons can hold up the glass top. Previously there was a gap (wide enough to stick a finger) around all pistons. We filled in the recesses on the ends of the table so we could tap holes to mount the connecting rods in the perfect location. Custom legs are also mounted to the bottom of the block. These tables are produced after they are ordered and have anywhere between a 2-6 week lead time before they ship depending on current in-house stock.